We’re participating in Maine’s Open Farm Day again this year along with scores of other Maine farms. 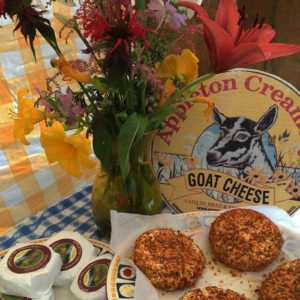 On Sunday July 24 from 11am to 4pm you can meet the goats, tour the farm & dairy, see cheese being made, sample & buy cheese. The pizza oven will be going! Also check out nearby wineries. ME Water Buffalo Co. in Appleton and Savage Oakes Vineyard and Winery in Union are also open farms. Our normal hours at the farm on Appleton Cheese Trail are 11 to 5 every Saturday through October if the weather permits.Read more about Appleton Cheese Trail.